he following extract has been translated from the final section of Richard Wagner och den Indiska Tankevärlden (Stockholm, 1985) by the Indologist and Sanskrit scholar, Professor Carl Suneson. Neither this section, or indeed any of Suneson's fascinating monograph, has, to my knowledge, been published in English translation. This is a pity because it contains information and insights that deserve to be available to all who are interested in the dramatic works of Richard Wagner. Those who wish to read the entire book (of approximately 100 pages) but who cannot read Swedish might like to seek out the German translation by Gert Kreutzer, published under the title Richard Wagner und die Indische Geisteswelt. or the reader who is accustomed to thinking of Wagner's Parsifal as an exclusively Christian work that is based upon a particular medieval poem, Wolfram's Parzival, some of this extract might come as a surprise. In his monograph on the Indian influence (direct and indirect) upon Richard Wagner and his dramatic works, Carl Suneson both summarised and extended all previous studies in this area. It might be noted that Wolfgang Osthoff's study of Die Sieger (The Victors) is contemporary with Suneson's book; these separate studies of the Buddhist elements in Wagner's works are complementary and together throw new light on this aspect of the Wagner canon. hose of us who incline towards the view that Schopenhauer's philosophy was the dominant influence on all of Wagner's later works (i.e. after the 1854 watershed), while accepting the importance of the Buddhist and Brahmanist (i.e. Hindu) influences, tend to regard them as secondary. It is also possible to take the view that these oriental ideas influenced Wagner directly and independently of any Schopenhauerian context. In any case, in order to understand what happens in Parsifal it is first necessary to recognise the importance of Wagner's belief (clearly stated in a letter of August 1860) in reincarnation and karma; this subject was explored in depth by Osthoff. It is more difficult to take seriously, in the light of the studies by Osthoff and Suneson respectively, the extreme view of Parsifal forcefully put forward in Richard Wagner: Parsifal by Lucy Beckett, that this drama is an exclusively Christian work in which Buddhist and Brahmanist ideas -- which, it should be noted, Wagner often blended and confused -- like karma, if present at all, are insignificant. The Indian concepts of karma (literally actions, also used in a wider sense to mean the results of actions) and punya (merit, which accumulates from good actions) are of fundamental importance in Wagner's Parsifal, a fact that has escaped most commentators, among whom Carl Suneson and Wolfgang Osthoff are the notable exceptions. ranslator's note: I have omitted some of the Sanskrit and Pali quotations, retaining only an English translation of the Swedish text. I have included English prose translations of the Middle High German quotations but I have provided translations only for some of the modern German quotations. One MHG quotation has been replaced by a link to another page on this web site where several descriptions of Condrie are provided for comparison. Where lines from Wagner's Parsifal are not translated below, I refer the reader to my annotated English translation of the libretto. I have kept most of Suneson's footnotes (marked as "author's footnote") except for those that only reference the poem of Parsifal in Sämtliche Schriften und Dichtungen; and I have added a few explanatory footnotes of my own (marked as "translator's footnote") as well as a few in-line clarifications (contained in [brackets]). Section headings have been added to assist the reader; they do not appear in the original. agner's "Bühnenweih-Festspiel", completed in the twilight of his life, is a summary of his musical and literary achievements, and the light of the Grail reveals reflections from many cultures and epochs. Sacred and profane, occidental and oriental, Christian and Buddhist, all included in this unusually beautiful and multifaceted synthesis. he formal starting-point for Wagner was Wolfram von Eschenbach's medieval epic-poem Parzival, completed around 1210. This work, a broad fresco in which all of the richness and motley of medieval society is brought to life, is characterised by a direct, popular and burlesque style. So it is quite unlike Wagner's Parsifal in character. 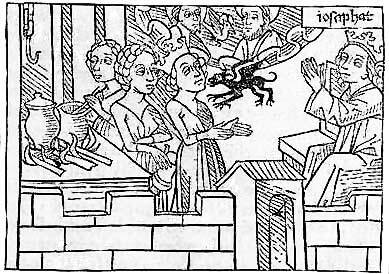 Wolfram's medieval realism can be seen as a contrast with the idealism of Wagner and the nineteenth century, and although Wagner and his contemporaries received Parzival as a mystical and allegorical work, the modern scholar is more likely to emphasise its political and didactic content. Already in Wagner's Dresden library there was the Middle High German "editio princeps" of the text, Karl Lachmann's edition, Berlin 1833, together with the modern German translations respectively by San-Marte (1836) and Simrock (1842), and Wagner made his first acquaintance with Parzival already in 1845.
uring the long process through which the Parsifal -drama grew to maturity, before it could be performed for the first time in the summer of 1882, elements of widely varied traditions and diverse origins were assimilated and blended together. Wagner took from Wolfram personal names and specific incidents, and he decorated the outer frame with Christian symbols in accordance with the aesthetic- religious view of art that he made his own. This does not hide the fact that motives with their origins in non-Christian world- views also found their way into the work. Wir sprechen davon, dass ungefähr dasselbe Thema (die Erlösung des Weibes) in beiden, Parsifal und Sieger, behandelt würde. Höchsten Heiles Wunder: Erlösung dem Erlöser! Dich nannt' ich, tör'ger Reiner, "Fal parsi" - Dich, reinen Toren "Parsifal". arsifal is in my opinion, of Wagner's completed music-dramas, that in which the Indian influence is most demonstrable. In what follows below, a number of episodes and ideas in the work will be subjected to analysis and discussion, which with a high degree of certainty can be said to derive from Indian tradition and Indian thought. This appears more natural when we consider Parsifal's dependency upon The Victors, even if an exact delineation of which motives are Indian, and which are not, might not be possible. Departures from Wolfram will be noted, although it should not be overlooked that even in that medieval work, despite its somewhat fluid geography, there are significant Indian contents 3.
wir lernen's im Walden vom Tier. That won't keep you busy! We send out no messengers now. We learn from the forest beasts. He! Du da! - Was liegst du dort wie ein wildes Tier? dess' Stiller Frieden dich umfing? From the branches what did the birds sing to you? What had the faithful swan done to you? gloriously to bless the [healing] bath. a wild, childish shot from your bow? We cherished him; what is he now to you? Do you realise your sinfulness? Tell me, boy, do you acknowledge your great guilt? O hero ! See the pleasant thresholds of the hermitages in the forest of Dandaka. In them the sages seek by their penance to gain purified souls. See the flowering forest abundant with fruits and tubers, with its fine herds of deer and peaceful flocks of birds. And see these clusters of lotuses spreading over the tranquil waters of the pools and lakes with their water-birds. The water falling from the mountains delights the eye, and pleasant are these forests, resounding with the cries of peacocks. remote similarity can perhaps be traced in Parzival 281, 23 to 282, 22 , where Arthur's falcon, which happens to be near to Parzival, attacks a flock of geese. The falcon wounds a goose, causing three drops of blood to fall upon the snow, which causes Parzival to think of his wife. The origins of the episode are more likely, however, to be found in two very different areas of Indian traditions, presumably combined by Wagner: one Buddhistic and one epic 5. Devadatta verwundete mit einem Pfeil eine Gans, welche über seinem Garten flog. Sie stürzte in den Garten des Bodhisattva herab, ward von ihm ergriffen, ihr der Pfeil ausgezogen und sie durch ein Heilmittel wiederhergestellt. Devadatta aber fordete die Auslieferung der Gans, da er ein früheres Recht auf sie habe. Das war der erste Streit, welcher zwischen dem das letzte Erdenleben begehenden Bodhisattva und Devadatta stattfand. killed one of the pair, the male. who were drunk with love." ere Ramayana is consistent with Parsifal in mentioning the female ( Sein Weibchen zu suchen flog er auf ) and the blood on the bird's body ( da starrt noch das Blut ). he act of Parsifal that is most influenced by Indian motives is without doubt the second, which in a powerfully expanded form builds upon a central episode in the biography of the Buddha. The Buddha's life-history is related piecewise in the oldest Buddhist texts in Pali, and it was only in the first century after the birth of Christ that there were compiled two complete Sanskrit biographies of the Buddha, although in different literary forms. Both works build upon an already long-established oral tradition and contain many legendary episodes. This applies especially to Lalitavistara, an undated anonymous composition from one of the first centuries of the Christian era, which contains both older and newer parts. The work reflects ideas that characterised a recent development in Buddhism, Maháyána. 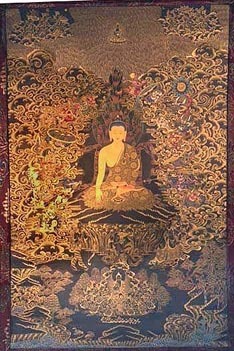 The Buddha character has developed transcendental properties and his life-history is played out on a cosmic stage. Lalitavistara was a significant component in the foundation that underlies the Tibetan text that Schiefner translated. The other work, Buddhacarita, is an early example of the most advanced verse form in Sanskrit, kavya, and was written in the middle of the first century after Christ, by a Brahmin who had converted to Buddhism, Asvaghosa. Buddhacarita gives a significantly more credible account of the Buddha's life than Lalitavistara. The later work had not been published in its Sanskrit original text during Wagner's lifetime although it could be studied in the French translation of the Tibetan text which Foucaux published in 1848 (see Schopenhauer's reading list no.11). The other early account of the Buddha's life, Buddhacarita, would not be published before a decade after Wagner's death. We can take it for granted that Wagner obtained his basic knowledge of the Buddha's biography from the work of Burnouf (no.10 on the reading list) and later from Köppen (no.26)). 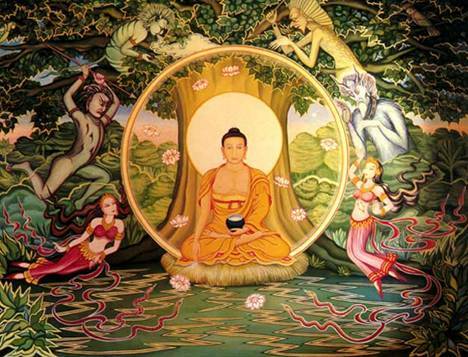 he central episode in the life of the Buddha takes place under the Bodhi-tree where he sits in deep meditation is search of highest wisdom and with it supreme enlightenment, thus to become a Buddha. This turning point in Buddha's life and development takes place despite the determined attempt of the evil tempter Mára to turn him from the path of meditation and wisdom. This event is described in detail and with artistic, dramatic power in the Buddhist texts. Mára attacks both with the help of his seductive daughters and with his warriors, armed with all kinds of weapons. Buddha resists the daughters' seductive temptations, and the weapons, stones and rocks that hail down upon him are changed to offerings and a peaceful rain of flowers, so that Mára finally accepts that he has been defeated. den Toren stell' mit seines Meisters Speer! Stop there! I banish you with the true weapon! The fool falls to me by his master's spear! Thus these nine dangers, wind, rain, rocks, weapons, charcoal, ashes, sand, mud and darkness, did no harm whatever to Siddhártta, but were converted into offerings. When Mára perceived this, as he was unable to approach the prince, he said angrily to his army from a distance, "All of you, seize Siddhártta, pierce him, cut him, break him to pieces, grind him to powder, destroy his desire to become Buddha, do not let him escape." Saying this, he mounted his elephant Girimékhala; and brandishing his formidable discus on every side, he approached the prince and threw it towards him. Were this weapon to be thrown against Maha Méru, it would cleave the mountain in twain as if it were a bamboo; were it cast into the ocean, its waters would be dried up; were it hurled into the sky, it would prevent the falling of rain for twelve years; but though it has such mighty energy, it could not be brought to approach the prince who was seeking the Buddhaship; through his great merit, it rose and fell in the air like a dry leaf, and afterwards remained in splendour above his head, like a canopy of flowers. pence Hardy wrote his book at a time when the Pali texts had not yet appeared in Europe. Today there are several texts available in which the motive of Mára and his discus can be found8. lthough the Indian Buddhist sources first became available in the west only in the 19th century, many centuries earlier echoes of the life of the Buddha had reached Europe in the indirect form of the once widespread Christian legend of Barlaam and Josaphat. Presumably during the 8th century Christian monks in Central Asia had come into contact with traditions of the Buddha and elements of these traditions, including the temptation scene, were woven into Christian proselytising in the form of the tale of the prince Josaphat, who was converted to Christianity by the monk Barlaam. From an original, now lost, in the middle-Iranian language, pahlaví, this story was transmitted in Arabic and Greek versions, which were translated into practically every language of the Christian world. In and with the 12th century Latin version which was the basis of translations into west-European languages, the legend achieved an unprecedented popularity in the middle ages, when Barlaam and Josaphat were regarded as historical individuals, finally resulting in their canonization by the Catholic Church. »ich tuon gar den willen dîn. diu hie ze lande iender iſt. act, as I do now." and if you will believe in God." then I will grant you this." now tell me, what you want from me." to be found anywhere in the land. and forsake the heathen faith." nâch dem helde ich selbe reit. unt diu im lieber wære. ich vrâgete wer diu möhte sîn. sô heize ich selbe Parzivâl. hin reit der ûz erkorne. and he loved her dearly. and I asked him who she was. My own name is Parzival. the Grail gives me other troubles." and then he rode away. hat is related in this short passage, however, is only Orgeluse's offer of marriage to Parzival ( ich bôt im lant unt mînen lîp ), his rejection of the offer in which he speaks of his wife ( er hete ein schœner wîp, unt diu im lieber wære ) and of his duty to seek the Grail ( ichn will iuwer minne niht: der grâl mir anders kumbers giht ), and his farewell. This episode can hardly be compared either with the attempted seduction beneath the Bodhi-tree or that which takes place in Klingsor's magic garden, and therefore it must be seen as a quite inadequate basis on which to explain Wagner's grandiose and dramatic treatment with its metaphysical resonances. gar, wan daz er was ein man. kurz, scharf als igels hût ez was. wahsent liute alsus durch nôt. not resembling a human being. but short and sharp like a hedgehogs coat. are people like that by misfortune. olfram refers to India by the curious name of Trîbalibôt. The name (Trî)balibôt probably derives, via the Greek form Βαλιβοθρα, from the Sanskrit Pataliputra [the modern Patna], the capital of the old kingdom of Magadha in the east of India, which has connections with the earliest history of Buddhism. Yes, one under a curse she might be. Herodias war'st du, und was noch? primeval devil-woman! Rose of Hell! You were Herodias, and who else? Come here! Come hither, Kundry! my Saviour, oh! So late! bleib'st du dem Sehnen abgewandt. until that source is sealed. he overcomes that desire fully conscious in the world. 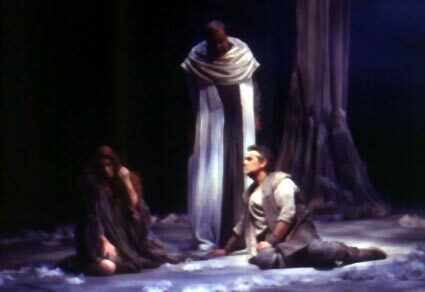 he Indian teaching of wisdom's decisive importance for final redemption coexists in Parsifal with Christian teachings. This true knowledge naturally affects the central character, Parsifal, and his development from der reine Tor to Gralskönig. The theme of der reine Tor is already, in some respects, found in Wolfram. Parsifal is obviously also a kind of Christ- figure, one who suffers the torments of Christ, although Wagner's understanding of Christ is highly individual, complicated, and in some ways incompatible with the Saviour known to Christian theology. Christ is, for Wagner, both Erlöser and in need of Erlösung (recall "Die Gottesklage" in the second act: erlöse, rette mich aus schuldbefleckten Händen! ) and there is between him and Parsifal [at the end of the third act] a kind of reciprocal pacification. On closer examination of Wagner's text, it is not unreasonable to perceive in his Parsifal-Christ figure a suggestion of the Buddhist bodhisattva-ideal. der all' dies Elend schuf! who caused all this misery! arsifal rightly accuses himself of having caused, in his ignorance on his previous visit, the present distress of the Grail knights. Yet he also states that he bears a burden of guilt from all eternity [seit Ewigkeit], which might be considered a remarkable statement, since his guilt originated in his present life. His self- accusal might be more reasonable if, for one factor, he is taking into account his previous incarnations and, for another factor, that like a bodhisattva he bears the burdens of others. This Buddhistic interpretation does not necessarily exclude the presence of the Christian motive of the sinless sufferer. harre sein', den ich erkor. du solt des gräles härre wesen. to hail you as king. lift the last load from his head! Be whole, absolved and healed! Now I shall perform your office. nce again Wagner has blended together Christian and Buddhist representations. Suffering has led to compassion and understanding, and it is through the power of these attributes that Parsifal has become worthy of the kingship and thus able to uncover the Grail. »meint ir got den diu magt gebar? unrehte iu denne dez harnasch stêt. unt dâ bî mit angest siufzec sîn. den man durch uns anz kriuze hienc? durch schulde hin zer helle erkorn. "Do you mean God who was born of the Virgin? when it is not fitting to ride in armour. and at the same time mourn in anguish. when they hung him on the Cross? to save us all from hell. reflect, sir, on these matters." O weh', des höchsten Schmerzentags! O alas the day of greatest pain! only mourn, ah! and weep. You see, that's not how it is. to whom they dedicate their prayers. because of God's pure, loving sacrifice. spares nature with gentle tread. today enjoys its day of innocence.